Wedding invitation caricature artwork: this is a caricature I completed for a couple who got married earlier this month. It features their pet dog and the Sheen Falls Lodge Hotel where their reception was. Also included is Ballybunion Castle which had special relevance for the bride. They’re big fans of tag rugby so of course that needed to be included in the wedding invitation caricature! Also included in the drawing is a white Volkswagen Beetle, a banjo, and a bottle of wine. 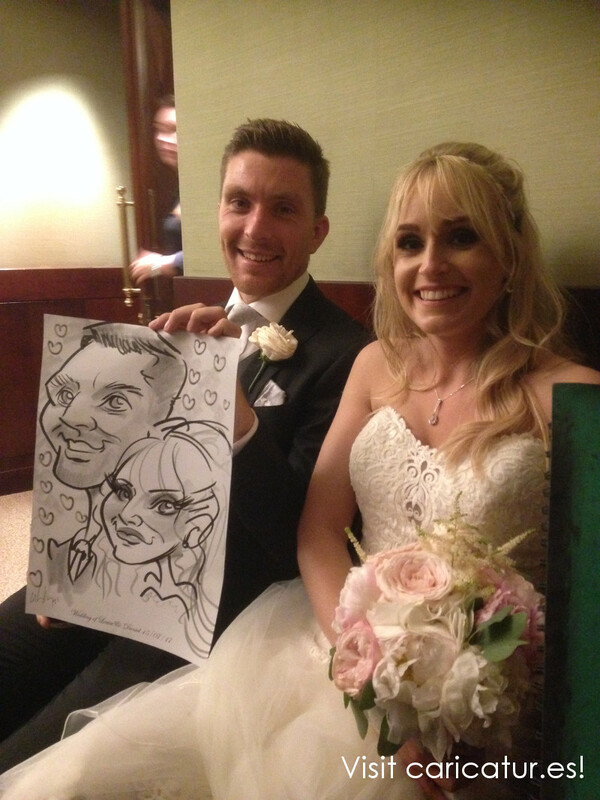 This couple were absolutely delighted with their caricature! For the preparation of a caricature like this I just need recent photos and some details you’d like included. This can be anything from where you got engaged, your hobbies, or a cherished pet. 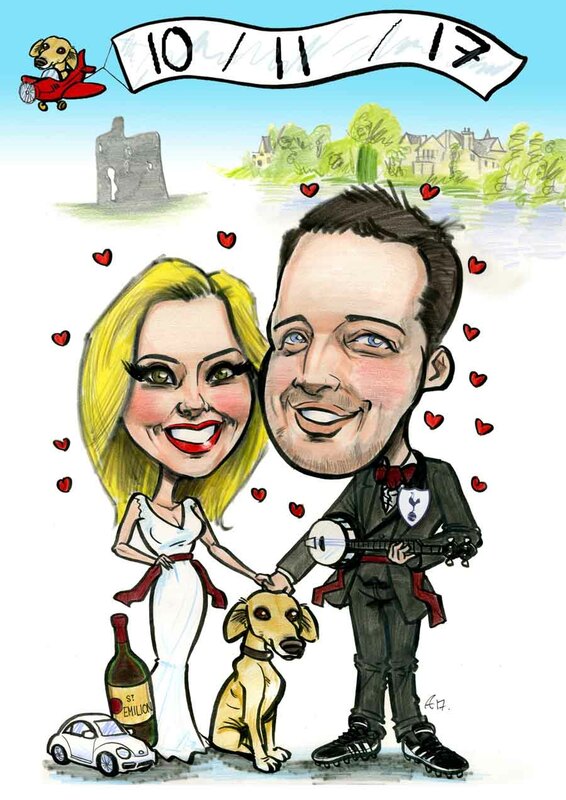 If you’re interested in a caricature like this for your wedding invitations just drop me a line for details! Fota Resort Weddings: Here’s a selection of my live caricatures from a wedding in Cork earlier this year. 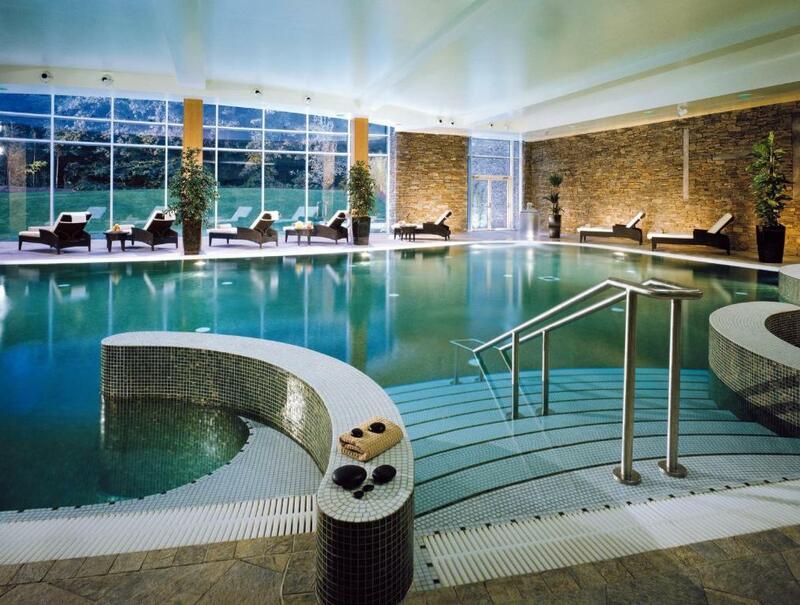 The venue was the splendid Fota Island Resort near Cobh in Cork. My live caricatures average around 3 minutes per face (or 5 minutes for a couple) so between 40-50 guests can get drawn in 2 hours, and many more in the 3 hour package! I also can be booked for your drinks reception and after the meal as well in a combination 4 hour session, just contact me for details! The paper is printed with the names of the couple and the date of the wedding and my caricatures make an amazing memento of the wedding! 2018 is filling up fast so drop me a line as soon as you can for prices and availability!